After probably one of the worst breakfasts we have had in Indonesia, we then unexpectedly got a free lift to the airport from the hotel which I guess saved us a few rupiah as it wasn’t that far away. 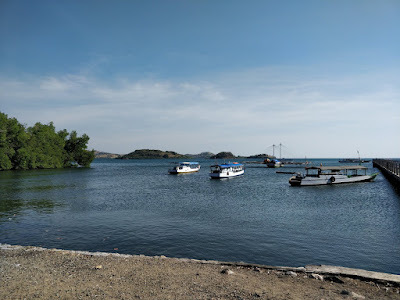 We had booked a flight to Maumere, which is a 2-hour flight over to the east of the island of Flores, and the plan was to work our way back west towards Labuhan Bajo and Komodo National Park, giving ourselves around 9-10 days to do so. We had nothing booked at all for this part of the adventure, apart from 1 night in the first town of Moni, which was sorted via email. There isn’t a lot of accommodation options online for the whole of the island, so we were going there to pretty much wing it and as we discovered, it doesn’t always go to plan! The flight provided us with spectacular views over various volcanos, the Gili Islands, the north coast of Sumbawa, Komodo NP and the 17 Islands of the north of Flores, before landing at Maumere. The plan here was to get a taxi from the airport and into town for the bus to Moni, which is around 3 hours west of the airport. As usual, we had done a bit of research on rough costs for travel and we had noted that the bus journey should be around 50-60k each, plus whatever the taxi took into town. Deciding that it would be better shared, we got speaking to a couple in the airport whilst waiting for our bags, and after a quick conversation we agreed it might even be cheaper for the 4 of us to share a taxi all the way to Moni, and would happily pay 100k each for this. So, we all marched out the baggage claim area and into the awaiting scrum of touts who all shout at you ‘Taxi Taxi’, ‘Where you are going Mister’ and asking, ‘How much you want to pay’. After going from 600k down to 300k, we agreed to go with one guy who said he would take us in his car to the bus terminal, and his friend would take us to Moni in another car. We double checked a couple of times that this was the plan, to which he agreed. We also both had to top up our SIM cards with more credit to buy a data package to work in Flores, as we had read it’s different ‘pakets’ on various islands, and after seeing a desk outside the airport doors, we spoke to the young girl there and explained what we needed. Deciding to buy a 12gb bundle each for 100k, she proceeded to top up our phones. Mine worked fine, but it wasn’t till we were well away from the airport before we realised that the one she put on Sadie’s phone was the wrong one! It was a much cheaper one and only gave her 2gb of data! Scammed! We all went with the taxi man, and jumped into his nice 4x4 air-conditioned car, and set off the short 10-minute journey to change car. His name was Stephano, spoke good English, was chatty and telling us some stories/jokes. As we drove down the main road, he initially tried to get us to go in a bus, where we reminded him of the deal we agreed, he then tried to get us into a people carrier that already had 4 people and luggage in it. We declined that also and it was soon becoming apparent that he had no ‘friend’ with a car and was basically trying to palm us off into any other vehicle. Reminding him again of his deal, he was at a loss on what to do, we even offered him 400k for him to take us, which he declined. Between us we decided we would be better off just getting on one of the buses, and he spoke to the driver of one and tried to tell us that it would cost the 300k, we refused and eventually got it for 200k between the 4 of us, which was still overpriced compared to what locals pay, but what we expected anyway. He also tried to say it would just be us 4 all the way to Moni, but we knew fine well that wasn’t going to happen as the bus soon filled up with locals. The road to Moni is a long winding hilly road, not suitable for people who suffer from travel sickness, as we soon found out as various locals started passing round plastic bags, and the inevitable throwing up into them and throwing out the bags onto the surrounding beautiful countryside began. We chatted to our new-found friends, Adam & Jen who were from the Manchester area and were also travelling for around 12 months, so we exchanged tips and experiences. They didn’t have any accommodation booked for Moni, so when we arrived they came to where we had booked, Bintang Lodge & Restaurant, to see if they had rooms. 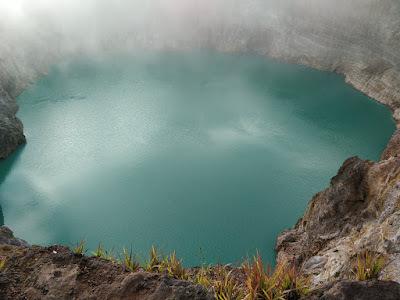 Luckily, they did, so they booked in for 2 nights, and after speaking to the owner Tobias, we also booked the 2nd night, meaning we could do the morning trip up to Kelimutu the following morning and then get an early bus the 2nd morning to our next destination of Riung. Tobias had asked me via email to confirm our booking the day before arrival, sadly I forgot and as space is limited here, we ended up in a room at the place which is adjoined to his hotel, next door to our new friends, yet we payed slightly more than them... and although a smaller room than we booked, it would do for a couple of nights and it was my fault for not confirming with him. After having a couple of beers, we took a walk along the small town, which to be honest hasn’t got much going for it, apart from some amazing views of the hills and surrounding rice paddies. We were going to eat at our hotel, but they had run out of chicken (no other meat available) so we went to a place called Mopi’s and despite having a wait of about an hour, the food was delicious. We watched a bit of the live band they had on playing to a packed-out bar, then headed back as we had a possible 4am wake up call, if the weather was clear. If not, we would get a 7am wake up call. Turns out we got woken up at 03:45 anyway, to the sound of some German fans who had been sat up in the bar watching their countries World Cup game against Sweden, and had managed to score a 95th minute winner, hence their celebrations! 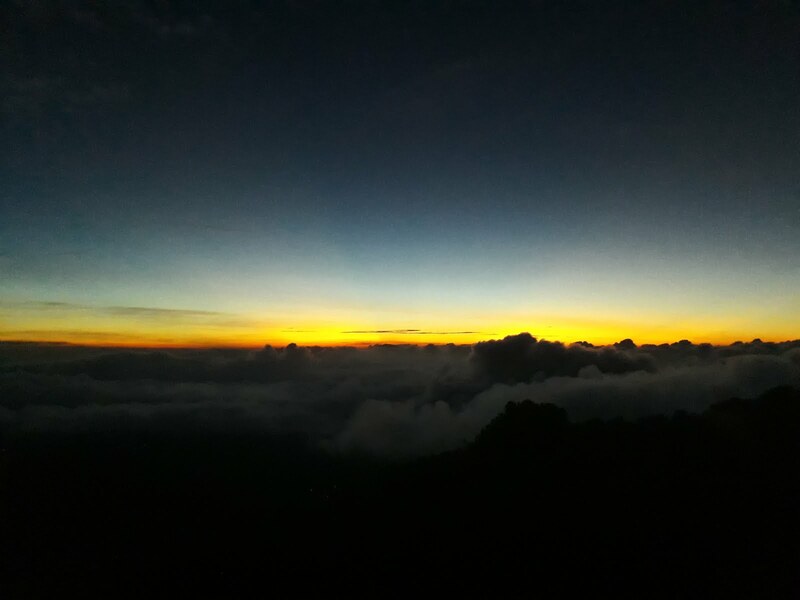 A short while later, we got the call to get ready as the sky was clear and we would be going up Kelimutu to see the sunrise over the mountains and 3 coloured lakes. The 4 of us got into the car and went on the 30-minute journey up the hills, another winding road, to a car park where we got dropped off and had to climb another 30 minutes or so up the hill in the pitch dark. As we got nearer the viewpoint, we could see start of the sun rising over the mountains in the distance, and were looking forward to an amazing sunrise. 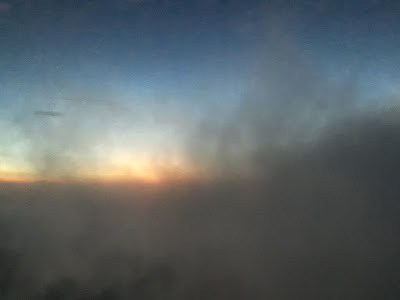 Sadly, not long after we got to the view point, the clouds started to come in over the lakes and blocked out our view for most of our time up there, we did manage to get a sneaky peek at the lakes, and they did clear eventually so we could get the usual photos taken of them. Adam & Jen had decided to do the 3 hours walk back to the hotel, we opted for the car back and after a quick simple breakfast, we both went back to bed for a few hours’ sleep. In the afternoon we spent time sorting out photos from Bali, had another little nap and ended up back at Mopi’s again for dinner, before coming back to catch the end of the England game, then bed. 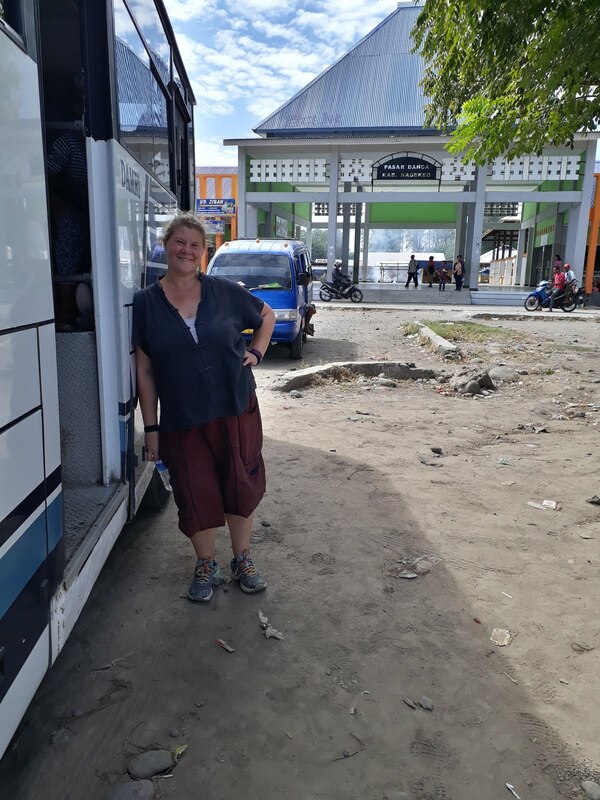 Tobias had told us we needed to get a bus around 8am to Ende, to catch the only bus of the day north to Riung, which we were told leaves at midday. 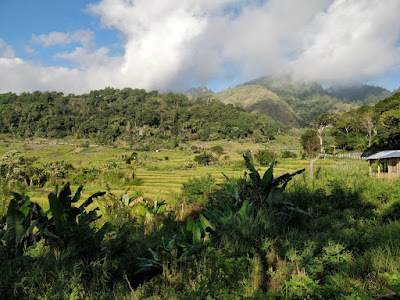 Ende is 2 hours west of Moni, so made sense and we all got up early for breakfast as Adam & Jen were also going to Ende, but then travelling on to Bajawa. We ate first, and as Adam & Jen just got their breakfast, Tobias hails down a car outside his hotel to take us to Ende, but then a bus arrived too, so after poor Adam shovelled down his breakfast, a quick goodbye to the staff and we were soon on our way on the 2-hour journey by bus, costing 35k each. 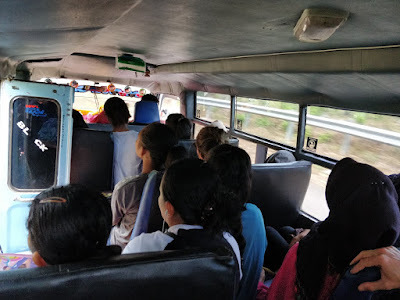 This journey wasn’t too bad, our bags on the roof and we enjoyed the amazing views and as usual over here, we got dropped off at one bus terminal on the East side of town, and had to get a 10k Bemo to take us all to the other terminal on the West side of town. We then got met off that as usual by awaiting drivers/touts and after we said our goodbyes to Adam & Jen, we were put on a bus to Riung. It was only 10am, and the language barrier proved too much to try find out when the bus left (remember we heard midday), so when we started moving around 10:15, we were a bit confused. I managed to get one local woman to confirm the bus indeed was going to Riung, we circled the town a couple of times looking for more passengers/animals/goods and then set off out of Ende around 10:45, much earlier than we expected. Luckily, we managed to run to a petrol station toilet just before we left, as this was a 4-5-hour bumpy journey to which we didn’t stop apart from once in a small town called Mbay so the driver could get some lunch. We got off to stretch our legs in this dusty little town, where some little kid about 8-year-old got on a nearby bike and proceeded to start it and fall off, we just heard it and turned around to see him get up and get a slap around the ear and run away… thankfully he seemed ok as the locals seemed more concerned about the bike! As we approached Riung, we were asked by the driver where we were staying, but as we didn’t actually have anything booked, I just said the name of one place called Nirvana Bungalows that I had heard was decent. To our surprise, the bus took us right into the gardens of Nirvana, we paid our 70k each and asked the staff about available rooms. 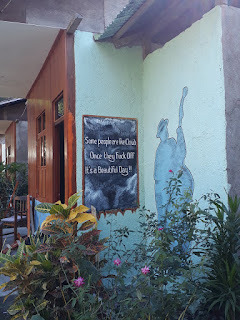 Thankfully they weren’t busy, and we got shown a lovely room for 400k a night (£21) including breakfast, so we took it for 2 nights which would allow us to do the 17 Island trip the following day, which was the main reason we came to Riung. 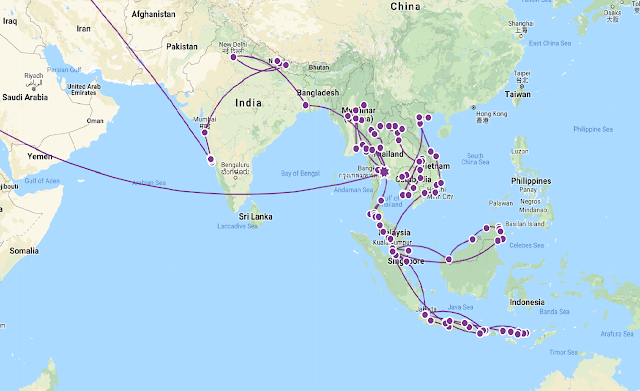 We spoke to one of the staff about the trip, and he initially quoted us 1m rupiah, which we quickly got down to 800k which was a private boat for us 2, and in line with the price I had read online. As we also needed some laundry doing, he said they could do it for 50k, so we handed it in and then went a walk round the small village after a quick nap. So, the next morning after breakfast, we walked the 15-20 minutes down to the jetty, and met our guy who introduced us to 2 locals who would be our boatmen. Both were quite young, and as it turned out, not too experienced either but thankfully the day went without any disaster. 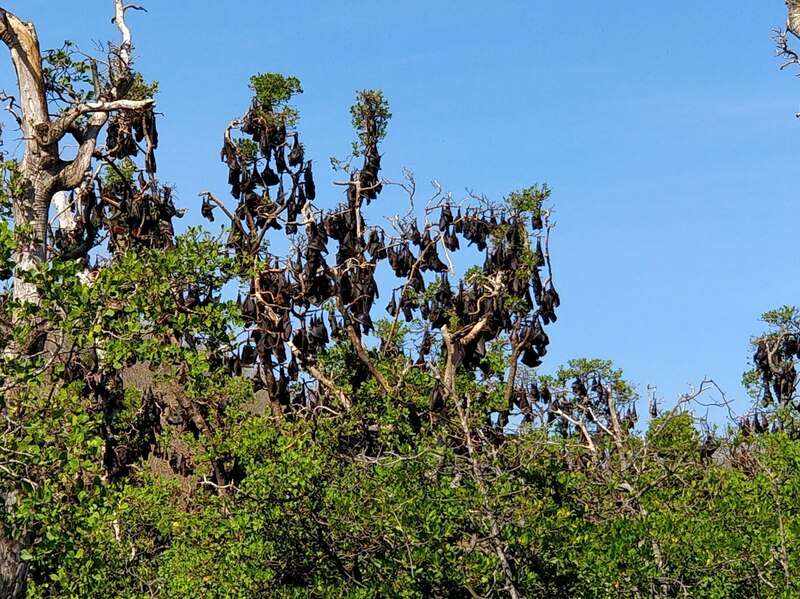 Our first stop was at Pulau Ontoloe, where we could see Flying Foxes (Fruit bats) who sleep on the trees on the island. There were literally thousands of them lining the mangroves of the island, as we got as close as we could for some photos. Another couple of boats were here too, and clearly one over the other side of the bay was disturbing them, as they all suddenly flew into the air and across to our side. 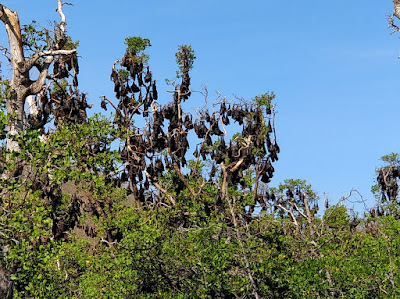 It was an amazing site to see as they all screeched and flew around looking for a new branch at our side, some of them were huge, biggest bats I’ve ever seen! We then went over to Nunsa Bampa for some snorkelling, which was decent. The water was clear and seen a few fish and some lovely coral. Then it was over to Nunsa Tiga for lunch, which was a beautiful deserted island, apart from one French family and us. One amusing moment is when the boats anchor got stuck whilst we were trying to dock on the beach, and one of the lads had to jump in to release it. Lunch consisted of some BBQ fresh fish with rice/salad/veg and fresh fruits. 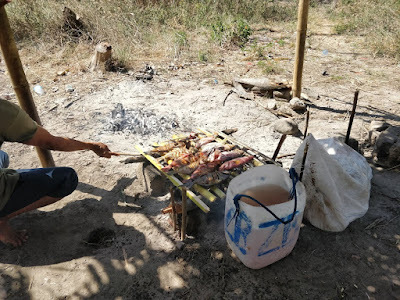 It was delicious and was plentiful, so much so that we gave the leftovers to our boat crew. 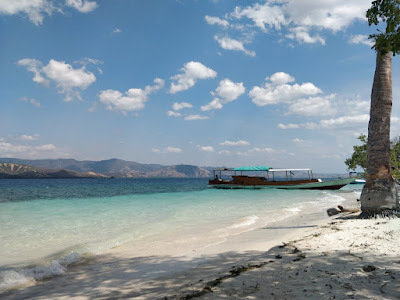 After chilling out on this gorgeous island with the most amazing views of the north coast of Flores, we headed to our last destination of Nunsa Rutong for some more snorkelling. 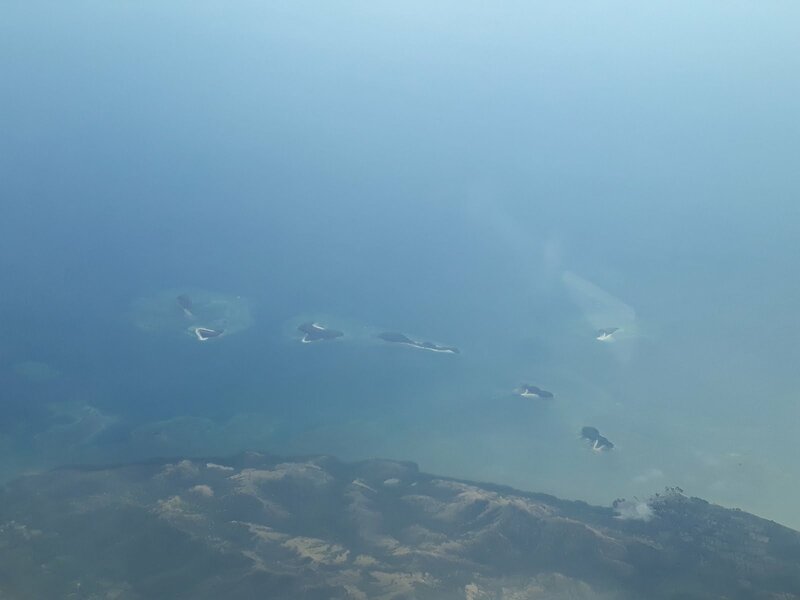 Sadly, in this region, they are known to use explosives for fishing and it’s apparent when you see the blast holes in the coral, such a shame to see this and hopefully it stops before it’s all gone forever. 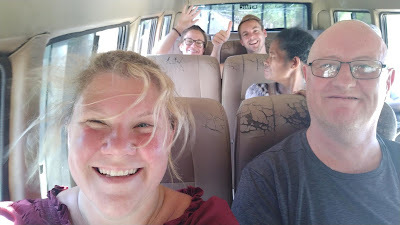 At around 4pm we headed back to get showered and then tried to get the staff to sort our spaces on the only bus of the day for tomorrow to take us to Bajawa, at 6am. Unknown to us, the staff advised us that tomorrow was local elections across Indonesia, and just 2 days prior the government had declared it a local holiday. This meant that the bus was not running tomorrow, and after a bit of a panic on what we were going to do, we were told we could arrange a private car to take us, but this would be 700k instead of the 70k the bus would have cost. 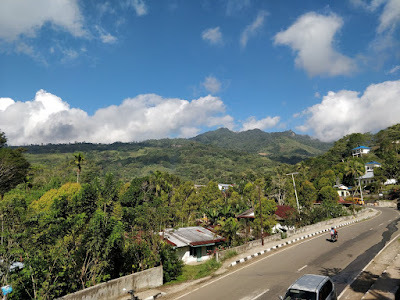 We didn’t really fancy another night here as there was literally nothing else to do in Riung, so we agreed to the car and the guy said he would confirm the departure time tomorrow morning, but thought it would be around 10am. We an amazing dinner that evening of grilled and fried squid dinner at a local Warung called Café Del Mar where we had two big plates of squid and rice and it was only about £6 including 2 beers. Then it was an early night (to be honest there wasn’t anything to do anyway), as it had been a hot and tiring day.